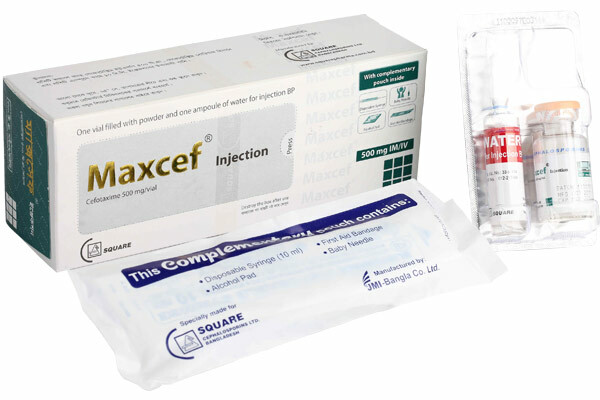 MaxcefTM (Cefotaxime) is indicated for the treatment of the following infections when caused by bacteria of established sensitivity: Septicaemia, Respiratory Tract Infections, Urinary Tract Infections, Soft-tissue Infection, Bone & Joint Infections, Obstetric & gynaecological infections, Gonorrhoea particularly when penicillin has failed or is unsuitable, Other Bacterial Infections such as meningitis. Prophylaxis: The administration of Cefotaxime prophylactically may reduce the incidence of certain post-operative infections in patients undergoing surgical procedures that are classified as contaminated or potentially contaminated or in clean operation where infection would have serious effects. The recommended dosage for mild to moderate infections is 1 gm 12 hourly. In severe infections dosage may be increased up to 12 gm daily given in 3 or 4 divided doses. For infections caused by sensitive Pseudomonas spp. daily doses of greater than 6 gm will usually be required. The usual dosage range is 100-150 mg/kg/day in 2 to 4 divided doses. However, in severe infections doses of up to 200 mg/kg/day may be required. The recommended dosage is 50 mg/kg/day in 2 to 4 divided doses. In severe infections 150-200 mg/kg /day, in divided doses, can be given. 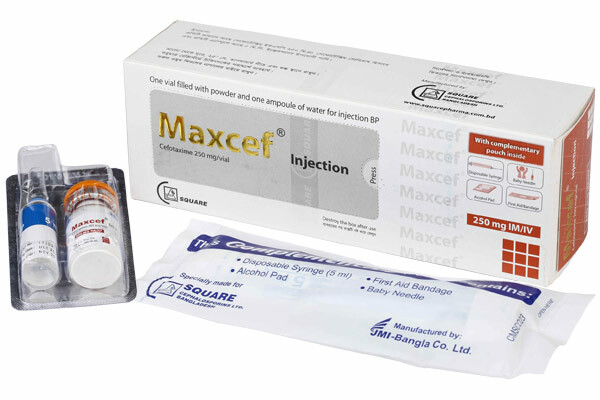 MaxcefTM 250 IM/IV injection: Pack of 1 vial contains Cefotaxime 250 mg accompanied by a solvent ampoule of 5 ml water for injection. It also contains a complementary pouch comprised of disposable syringe (5 ml), alcohol pad and first aid bandage. 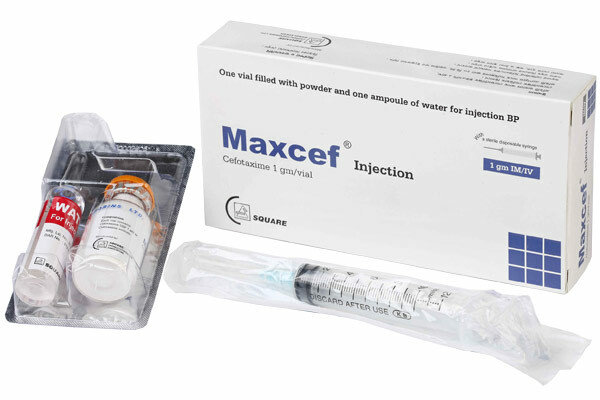 MaxcefTM 500 mg IM/IV injection: Pack of 1 vial contains Cefotaxime 500 mg accompanied by a solvent ampoule of 10 ml water for injection. It also contains a complementary pouch comprised of disposable syringe (10 ml), alcohol pad and first aid bandage.